Hayden Kramer, better known as Herobust, is a Bass Music Producer from Atlanta, GA. His latest release “Vertebreaker” caught the community by surprise with it’s innovative and fresh take on modern electronic music. Herobust recently wrapped the “Vertebreaker World Tour” where the response was incredible for the new tunes and many new fans have been made in countries like China, India, Australia and Canada. He will also be performing at EDC Las Vegas, Bonnaroo, Shambhala and many more festivals this summer! Herobust seems not to be constrained by genre, and has proven that he is pushing forward into uncharted musical territory with the support of Diplo, Skrillex, Datsik, Flosstradamus, and Marshmello. He has also been commissioned by the likes of Third Eye Blind, D.R.A.M, and Knife Party for official remixes. And after much success, Herobust will be releasing his first music video for “Move Mint” in the coming months. YOUREDM includes Herobust in their “Top 5 Best Trap Artists 2016” and Insomniac credits him as “one of the hottest voices in the trap-dance movement”. 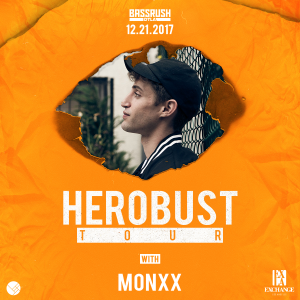 Herobust is represented by 24 – 8 MGMT and CAA.